Most of you will by now have heard that there will be a 60km Ultramarathon in Podersdorf. It is designed to be a team competition with 5 men and 3 women. There are however a few brave riders, who will attempt to do this solo. 60km in flat water are tough, but Podersdorf is Europe’s Wind Paradise. It’s the location of the Surf Worldcup after all…. Here are the brave men that will attempt to paddle 60km Solo (in alphabetical order). We wish them good luck for the race. You can check the conditions in Podersdorf here. The forecast for this weekend is up to 20knots of wind…. Austrian SUP Pioneer, author of the first German SUP Book, winner of the Austrian SUP Championships, Naish teamrider, riversurfer. He proved he is up for tough challenges by paddling 700km from Graz to Belgrad in SUP zero conditions this winter. He also won the Chiemsee SUP Marathon in 4°C, snow and storm. First time on a SUP? Are you kidding me? What else? versatility on any kind of water, surf, downwinder, white water, rivercruising or the local pond. Born in Vienna, Austria, Christian now lives in Podersdorf, right by the lake, so he is the local. Aside from SUPing he climbs, swim, cycles, runs and windsurfs. He is a ISA SUP Instructor. His first SUP attempt was in Podersdorf at an exhibition and on his second day on a SUP he already participated in his first SUP Race. What else: The Ultramarathon will be my longest and most exciting event so far, it will come down to how fit you are on that day. Having a great affinity for rivers and oceans from a very young age, Markus has been paddling over the last 35 years in all sorts of paddling competitions – from flatwater to surfski, dragonbaoting and SUP. He is a well-rounded athlete & editor of the German SUP special / Kayak magazine. What else: Looking forward to the hard work in Podersdorf! Great guy who lives in Majorca, Spain and runs the Kitshop El Nino on the beautiful island. I met Ruben last year at the Silvaplana Race and we travelled from there to Holland. He proved at the 2011 220km Eleven City Tour that he is up for tough challenges. First day on a SUP: In 2008 in the Spanish Kite Championsships. It was the first Spanish Champion of paddle where only was 7 competiters. Awesome, nice guy from Switzerland. I met him in Podersdorf last year. He runs his own SUP School SUP SWISS in Switzerland. He started Standuppaddling 4 years ago and is still as stoked as on day one. He told me this race is about the challenge and finishing, not about who wins. 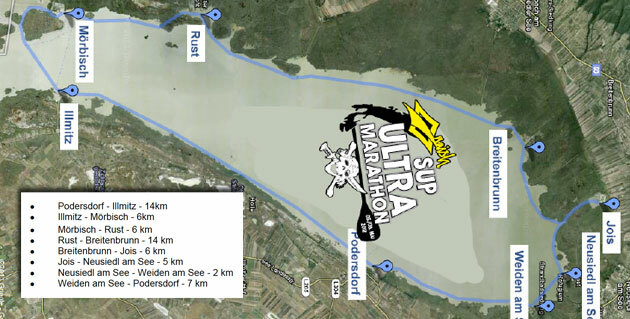 What else: Looking forward to Podersdorf, the event, the party and the Ultramarathon, of course!